Dr. J.J. Hurtak, Ph.D., Ph.D.
As many pathways of knowledge are now coming together, we wish to affirm a common basis for science, medicine and spirituality -and that common basis is a higher consciousness connected with what we call the “embodiment of Light” or the Light Body. We are an open-ended system, not limited in our ability to work only with the biochemical body and the psychochemical body, but capable of expanding those pathways into what we call the eka body of many plus and minus relativities, both in and beyond this physical form. Let us first recognize that eastern philosophy and future science are meeting within the larger construct of the energy flow system of the body and the cosmic body that surrounds us. Ancient Chinese star maps demonstrate how the human body is connected with the planetary spheres and beyond. There are amazing lines of energy that run throughout space, and we must understand that these energy lines are encapsulated even within the basic leaf of a tree. Former Soviet scientists demonstrated in early work with Kirlian photography that even after removing material from a common leaf, a complete phantom leaf remains in terms of a light energy field, at least for an initial period of time. In other words, the physical reality is secondary to the matter-energy construct. Vibratory lines which connect levels of human electrochemical activity with astrobiological circuits that span the solar system and are connected with resonating star systems. The axiational lines connect the acupuncture mapping of the human biological system with superior astrobiological analogs. (see Key 317). Axiatonal lines are existing energy fields in patterns working with acoustical vibrations running throughout the body and beyond. Through this, the body is maintained and also can be remade; through this, all proper functions of the body can be restored and accelerated; through this, the body can be rebuilt, cell by cell, molecule by molecule, thought-form by thought-form. The human body is but one embodiment of several energy vehicles. In that sense, we are part of an electromagnetic energy system, as known by modern science, but one that is subordinate to the circulatory pathways of other fields and levels of evolution that reach throughout the stars and beyond. More importantly, there is a type of “garden” within the mind’s eye, which allows us to interconnect with the energy fields of the body to become conscious biotransducers, aware that we are continually tapping into the energies of the universe. Here we recognize our multi-dimensionality: we are not only an electromagnetic body, but we are also an epi-kinetic body of sound vibration and a body of many plus and minus relativities, the eka body (See The Five Bodies, J.J. and D.E. Hurtak). We have, in essence, what the ancient Chinese called the “five Buddha bodies”. When we can actively work with them we can achieve higher levels of consciousness. We are, in effect, a vehicle of many vehicles, a system of many bodies working on many levels. We also now know that sound is all around us. The black hole in Perseus* is recorded to be sounding A# at 57 octaves below “middle C”. This is not the only sound in space; scientists have recorded eerie sounds from the aurora borealis around our planet, revealing that everything is vibration. And although it is difficult to perfectly equate the frequency spectrum of cells and molecules to that of sound, many attempts by scientists and artists have taken us one step closer to understanding that we are a symphony of creation. Light radiations of the cosmos such as those from Perseus also inaudibly interact with our human sensory system. I believe we can subconsciously connect with approximately 80 octaves of vibrations, even though most of them are inaudible. Each set of 80 octaves is a vibration of combined interpenetrating primary cosmic radiations of higher, middle and lower resonance, similar to the three gunas in Sanskrit. Material from the oriental heritage, as well as from modern investigations of the biohelix system of DNA, as shown by Dr. Deamer and Susan Alexander, are being validated. We are seeing how our body is part of a sound symphony which can be augmented by various vibratory sounds reaching within the neocortex, redefining post-Einsteinian science. We are recognizing that this higher area of the neocortex, utilizing both left and right hemispheric functions, can activate supermental powers. More importantly, that sound can help us heal ourselves when we have the right pattern of frequencies. They are there, within the structure of the universe down to the sounds of the DNA, vibrating in your body. We believe that even the ancient temples were created with a particular resonance to augment consciousness. We have done extensive research and sound testing throughout Egypt and the Yucatan, correlating the resonance patterns within the ancient massive stone structures. Using low frequencies as well as supersonics, our body and mind can tune into different realities. These frequencies are not only paraphysical and musical measurements, but ways to activate actual contact with levels of parallel evolution. We are truly being prepared for a realization that we are surrounded by a higher thinking evolutionary intelligence. We are basically tuning forks of energy, working within a planetary and ultimately a cosmic grid system. How does the activation of sound work in our bodies? There are many points of resonance, from our DNA (as researched by Susan Alexander) to the pyramidal cells in our brain. The pyramidal cells also act as electrocrystal cells immersed in a neuronal layer of tissue that operates in the fashion of a liquid crystal oscillator in response to different energetic/light commands. We found that biogravitational encoded switches are present in our brain which allow a type of crystal network to release ions that induce currents to the surrounding dendrites. 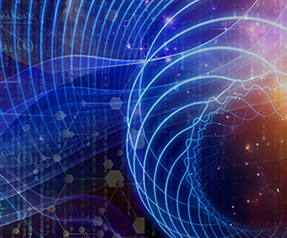 So we have a biocomputer system in our brain that, when activated, takes us beyond the singular synaptic gap to experience intense energy waves. If we harness these properly we can materialize and dematerialize things around us. This is basically the definition of higher consciousness, which appears to be quantized. We are capable of materializing and dematerializing forms of structure, specifically atomic structure. We can also project energy images through all forms of matter into another mind through mental projection. And all this can function independent of time. Yet it is the higher consciousness which produces the biological changes in the molecules and the atoms and is capable also of changing proteins and minerals into other forms. It is able to work in linear and non-linear functions. The value of space and time is thus seen to be truly arbitrary. There is an electric activity that takes place in some individuals that can be amplified with the right magnetic fields. When the eyes are open, there is certain magnetic activity and when they are closed there is another. Every time you open and close your eyes you are activating a magnetic signal which is a small demonstration of the simple changes that take place in the brain. It appears that when the left and right hemispheres are in balance, this energy field can be activated and a beam of light can literally be sent like a biological laser beam. Add that to the higher frequencies and vibrations and we understand what the ancients of our western heritage called the activation of the Gematria, the inner body of knowledge through sacred sounds. Research that we and our colleagues performed showed that certain names and sounds activate, in some individuals, the supermental power to materialize and dematerialize matter. The Third Eye area can be activated by certain sounds. We also found that other life forms, both positive and negative, can resonate with these sounds and extend themselves into our domain. When this is combined with an understanding of the axiatonal forces, localized or distance healing can be produced. Some healers in Mexico, Brazil and the Philippines have been able to work with certain sounds to activate various parts of the body. Using special cameras in Mexico and Brazil, Dr. Puharich and ourselves were able to observe actual radiations of light coming in and out of certain organs when the healers used specific musical forms. We believe that this implies a higher Image and organized geometry behind our physical state of being. This would demonstrate how our body has been designed to have a higher resonance and Light vibration, that can tap into a higher consciousness blueprint. However, the very premise that we are a Divine blueprint in flesh is now being challenged by the endeavor of human cloning. Although adult stem cell research can lead to many positive results in medicine, cloning entities and manipulating their basic form is another matter entirely. Historically, the ancients warned about problems with the process of creating a complete entity through cloning. Egyptian documents, Chinese oracles, and reports amongst the indigenous peoples of Central and South America all give illustrations that our image is unique and not to be manipulated. When lesser forces tampered with genetic lineage, as described in Genesis Chapter 6, grotesque products resulted. A cloned being may have the semblance of beauty on the surface, but may unwittingly usher in a different level of specieshood. The axiatonal lines can become permanently severed from the original consciousness domain, if the pattern becomes extensively changed. Yet there are benefits from genetic engineering that can be seen in adult stem cell research. Seen from the standpoint of modern “regenerative medicine” (which accords with electromedicine in The Keys of Enoch®), new studies in the United States are showing, in conjunction with stem cell research, how fingers and toes can be re-grown and how spinal systems that are broken can be fused anew. This regrowth takes place because there is a matrix behind the physical body connected with the axiatonal lines. So we are seeing a whole new area of medicine emerging with adult stem cells which confirms the higher matrix of life. Which direction should we take now? The high road is to recognize that we have a greater image in the stars. Yet many prefer to go down with the non-biodegradable flotsam and jetsam of the science that continually limits itself to the importance of the matter body without seeing the energy body behind it. We are part of a Divine Matrix. In our own way, we are beginning to discover that we have a Higher Image.